Maharashtra State Government has sanctioned more than 1 lakh houses under Maharashtra Ramai Awas Yojana housing scheme 2018 for poor families. The Social Justice Department has sanctioned these houses in Aurangabad, Amravati, Mumbai, Nagpur, Pune and Nashik division forFY 2018-19 under Ramai Housing scheme. The Maharashtra government targets 200 to 300 houses in every district. Ramai Awas Yojana is being implemented by Social Justice Department to build more than 1 lakh homes for the poor families belongs to scheduled castes and nav buddha caste. 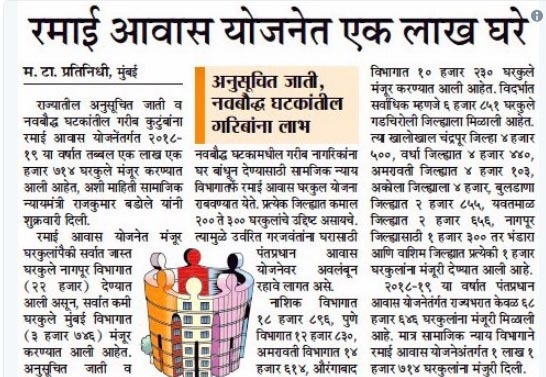 Social Justice Minister Mr. Rajkumar Badole said that total 1,01,714 houses will be build under Ramai Awas Yojana 2018-19 and this is the 1st time in the history of the Maharashtra state that such a huge number of houses have been sanctioned for poor people. The primary objective of Ramai housing scheme to provide own roof to every homeless person and to realize the Vision of “Housing For All”.